The following is a history, in genealogical format, of the descendants of James DAVISON, born 1809 in County Monahan , Ireland and Jane MORAN , born 1819 in County Derry (Londonderry), Ireland as far as I have been able to compile to date James sister Elizabeth DAVISON also came to Canada with her husband Henry SERGISON. 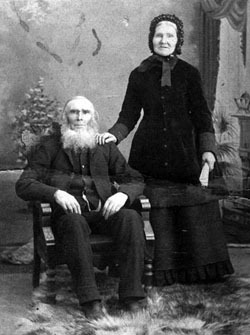 James and Jane married in Canada circa 1840 and lived near Uxbridge in Ontario (now Durham ) County, Ontario where their first six children where born. They then relocated to the 12th concession of Sullivan Township, Grey County , in 1855 . They appear in the 1861 census of Sullivan Township with a family of ten. William, their oldest son (1842 - 1919), married Ann FLEMING about 1867, and the following year moved from Sullivan Twp. to Lot 2, Con 20, of Greenock Township. Their oldest son George, was born in Sullivan Township, while Jane, William, and Samuel Fleming, were born in Greenock . John was the second son (1844 - ? ), but I have no further information on him. James (1846 - 1943) moved to Detroit , Michigan , as a young man. He married Eliza Mary WALTON and raised a family two girls, Lena (Mrs. Ernest POTTER ) and Mae (Mrs. Ernest MARCEL ), and a son John. Annie (1848 - 1885) married John FOSTER. Annie and John had a family of eight. Rebecca Jane (Mrs. Wm. OSBORNE), William, John, David, Annie, Henry Samuel and Fred, who was raised by his grandmother Jane DAVISON in Greenock. Annie died a few days after Fred was born. Samuel (1853 - 1943) operated a hardware store in Chesley, Ontario, and was married first to Mary Jane THOMPSON. They had a family of six, Alice, William, Annie, Robert, John and Samuel Melville, before she passed away in 1893. Secondly Sam married Jennett ANDERSON in 1895 and their family was, Margaret (Mrs. Robert McFARLANE), Wilfred, Andrew and Elizabeth (Mrs. Fred REUTER ). Thomas (1854 - 1928) moved to Michigan where he married Julia CONOVER and had four children. Henry (1856 - 1893) never married and died in Greenock Township when only 27. Rebecca (1856 - 1930) married a James CARSON and farmed in Sullivan Township near Desboro. Their family was, Jenny (Mrs. John CRAWFORD), Harry, Thomas who became Chief of Police in Owen Sound, Ontario, Ida (Mrs. Alfred FOSTER), Edward, Robert, Delsina (Mrs. Geo. URQUHART), Elmer and Robert. David (1859 - 1939) married Margaret WATSON , daughter of Wm. and Jane RITCHIE. Dave and Margaret lived in Tawas City, Michigan, and their family was; Matthew, James, Anna May (Mrs. Geo. SMITH ), Orville, William Floyd who died in infancy, Mabel (Mrs. Percy KINNISH) and William. Jane (1861 - 1943) married Matt DANIEL. They lived in Paisley, Bruce County, and had a family of two daughters, Annie May, who died at age five and Della who married Fred McLACHLAN . Elizabeth (1863 - 1929) married Robert WATSON , son of William WATSON and Jane RITCHIE. Lizzie and Bob farmed on lot 3, con B of Elderslie Township and raised a family of three sons, Fred, Marshall and Melrose. Kathy WATSON was born and raised in Greenock Township and is a dirsct descendant of the captioned couple, see her Pedigree Chart. Kathy and her husbnd Case VANDERPLAS currently live in Oakville, Ontario. Other Ancestral Families for Kathy are; WATSON; DAVISON; LAMB; TAYLOR; METCALF; WILSON; RUMIG/ ROUMEY & REID. The following pages show most of these families in more detail, but this genealogy is by no means complete and ultimately I hope to uncover more information about James DAVISON and Jane MORAN, where they lived prior to coming to Sullivan Twp, when they came to Canada and who their parents were. Meanwhile I would be pleased to hear from all of those reading these pages that recognize errors or omissions or have additional information that could be used to update this family history.